Having first attended Limmud Conference in 1994 at the then Oxford Polytechnic, and subsequently attended as Limmud migrated to Worcester, Manchester, Nottingham and Warwick, I was excited to see how things would be at this year’s brand new venue, the hotels surrounding Pendigo Lake in Birmingham.It did not disappoint, the plushness of the surroundings not detracting from the atmosphere and indeed an even greater ‘buzz’ than usual being evident. I went up for a long day on the Monday of Conference and presented three sessions.The first was a panel on moral and religious aspects of current affairs in ‘Question Time’ style. My co-panellists included Rabbi Laura Janner-Klausner and John Mann MP. Rather disconcertingly, the audience were given different coloured cards to hold up depending on whether they agreed or disagreed with the panellists. My second session was a panel discussion on my new book launched at our Shul in October, Faith Without Fear: Unresolved Issues in Modern Orthodoxy. My co-panellists were Rabbi Alex Israel, a well-known Israeli (but British-born) lecturer and writer, and Rabbi Ysoscher Katz, a fascinating New York Rabbi who was brought up as a Satmar Chasid but has moved over to the movement known as ‘Open Orthodoxy’. The panel was very ably chaired by Lindsey Taylor-Guthartz who teaches at Cambridge and LSJS. The third session was about the problem of evil in the Talmud and contemporary philosophy of religion – essentially a very condensed version of the five-part course I gave at Hampstead from December 2014 to April 2015. 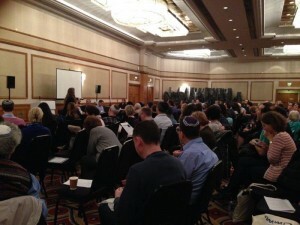 The Limmud audiences were as intelligent and generous as always, and once again it was a privilege to be there.